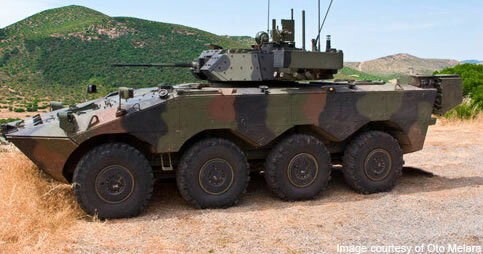 Like most Western Countries, Italy has also been steering towards the use of 8×8 wheeled AFV’s, so as to give its armed forces a more rapidly deployable force, which is quicker on its feet around the battlefield thanks to the use of wheels rather than slower tracked vehicles. Like all most modern AFV’s within the Italian Army, they are developed and manufactured in a consortium of indigenousness companies working together towards the finished vehicle. IVECO Fiat developed and manufactured the standard vehicle hull and the automotive components (engine, transmission and suspension etc) of the vehicle, whilst OtoMelera designed and manufacturer the turret and its systems. The first 8×8 wheeled vehicle they developed was the B1 Centauro Tank Destroyer which was armed with a 105mm main gun. The vehicle has not only been purchased by Italy, but also exported with a 120mm main gun. Production commenced in 1991 with final deliveries in 2002. The next vehicle developed by the consortium is the VBM (Veicolo Blindato Medio) Freccia 8×8 wheeled Infantry Fighting Vehicle. Developed on an extended Centauro hull, the first prototype was delivered to the Italian Army in 1996 and entered service in 2009. The vehicle uses a IVECO Fiat VTCA V6 turbocharged diesel engine, which generates 550hp and coupled with an automatic transmission. It uses hydrogas suspension, with the front four wheels being power assisted steering. Engine section is on the front right of the hull with the driver on the left. The vehicle has a very good overall mobility capability. The vehicle’s hull and turret are aluminium with a layer of ballistic steel fitted to provide protection against 25mm to 30mm rounds and 6kg mine blasts. It is also equipped with nuclear, biological and chemical (NBC) protection and automatic fire suppression systems. The Infantry Fighting Vehicle is equipped with the x2 man HITFIST® turret which has an Oerlikon KBA 25mm automatic cannon, a 7.62mm coaxial machine gun and roof mounted 7.62mm MG as well as a pointing laser device and a thermal night camera. It can transport 7 troops in the rear or this area can be used for other roles. The ATGW variant has x2 Rafael Spike anti-tank guided missile launches, with one fitted on each side of the HITFIST® turret. The Mortar Vehicle is fitted with a Thales Defense Armament 2R2M, striped 120mm mortar in replacement of the HITFIST® turret. It has an automatic loading system, a hydraulic system for cushioning the recoil, and an automatic handling and shooting management system. The Command variant is equipped with the Oto Melara Hitrole 12.7mm turret, transmission systems, LCD monitors and computers pitched. The ambulance variant has the same hull as that of the command variant but is fitted with the medical equipment necessary for rescue and treatment on the battlefield. A recovery vehicle has also been developed to proved repairs and recovery to the other variants on the battlefield. In 2006, the Italian Army placed an order for 249 Freccia’s of different variants. The order includes 172 IFV’s, 36 anti-tank vehicles, 20 command vehicles and 21 120mm mortar carriers. 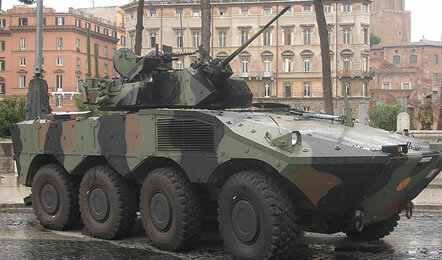 The total cost of the acquisition of these vehicles by the Italian Army is estimated at €1,540m spread between 2006 and 2014.